Welcome to the Hamburg Rotary Club! The Rotary Club of Hamburg inducted Ed Hamerski into the international service organization at its Feb. 26 meeting. Rotary President Brandi Reed, left, and Rotarian David Evans, right, who sponsored Hamerski conducted the ceremonies welcoming the new Rotarian into the Rotary club. Ed lives in Lake View and is employed by the New York State Department of Transportation and owns Classic Image Landscape. This year's inbound exchange student Max Kellenberger gives a presentation to club members. Max described the history, architecture, geography, culture and many other interesting facts about the Czech Republic. Thank you, Max, for such an interesting presentation! 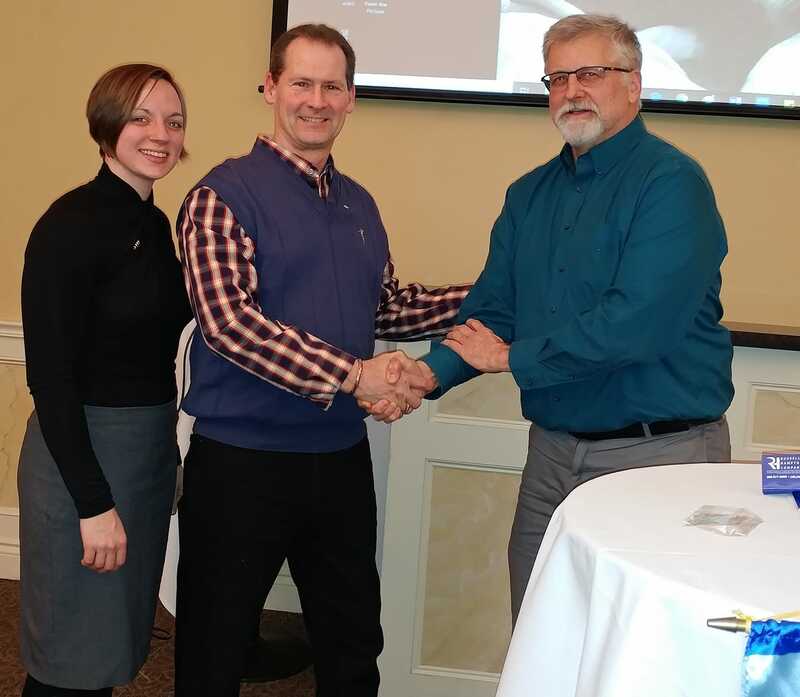 The Rotary Club of Hamburg recently inducted Katie Malvin as its first new member for 2019. Rotary President Brandi Reed, pictured at right, conducted the ceremonies welcoming Ms. Malvin, who works for Century 21-Ganey. Welcome Katie! For 12 years, Rotary Club of Hamburg has sponsored and coordinated Warm the Children, a program designed to provide children in need, who reside in the Southtowns, new, warm winter clothing. Since 2016, we have partnered with Sears in the McKinley Mall, which, as most know by now, is the only remaining Sears store left in our area. Under McKinley store manager, Debra Mahaney, our participating families and volunteer shoppers have consistently experienced the kind of service customers long for: helpfulness, kindness, patience, and a willingness to find the lowest prices possible for clothing being sought by families in need. All this is being done while Sears employees, those truly on the “front lines,” read and hear daily about the demise of their employer. If you haven’t been to Sears lately, I’d encourage you to stop by Sears McKinley- you’ll find very nice merchandise in an extremely clean, well-organized environment, staffed by very pleasant staff, who are doing the best they can under extremely tough circumstances! Ken and his family are involved with the Honor Flight Program and he gave a very compelling presentation to the club on this program. His father is a WWII Veteran who had the privilege to participate in the program. Ken explained how moving it was for his father and all his family who were able to witness their loved one be honored in such a way. Ken's whole purpose for presenting to the club was to offer this same great opportunity to other veterans. Priority is given to WWII Veteran’s followed by Korean War and veterans from other wars with a catastrophic illness. The goal is to take all veterans on future flights. There is no cost to the veteran to participate. Anyone who may know someone who qualifies can reach out to Buffalo Niagara Honor Flight at www.buffaloniagarahonorflight.org. Monday, November 12th club members assisted the Salvation Army with their Mobile Food Service. 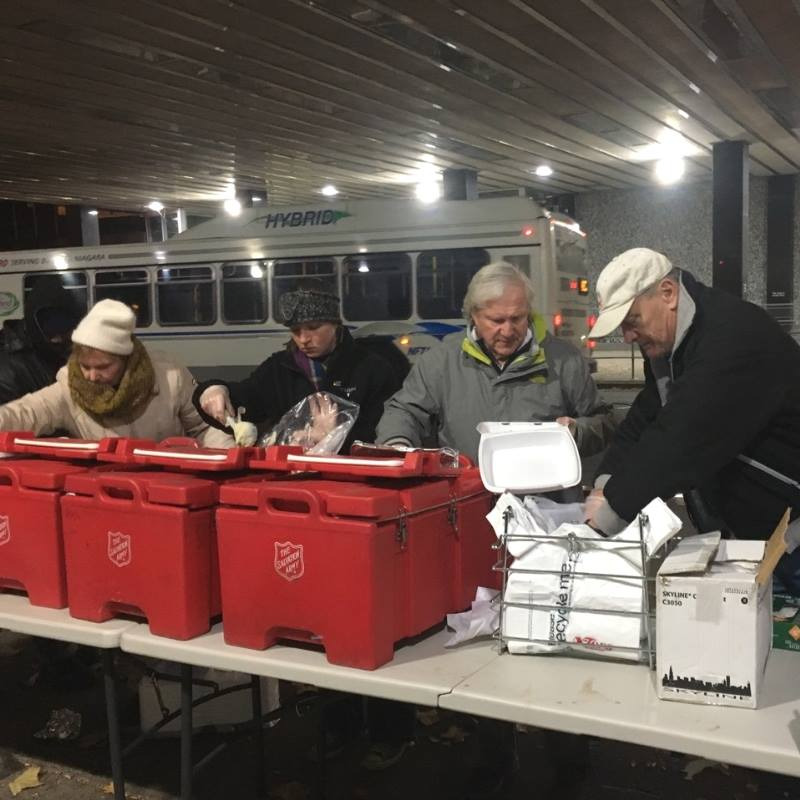 They distributed hot food and drinks under the viaduct at the Downtown Buffalo and Erie County Library where the Salvation Army distributes meals weekly. Another great service project to benefit our community! Thank you Salvation Army for the great work you do! 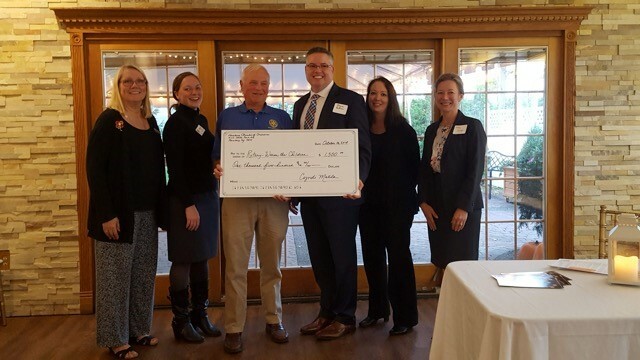 Hamburg Chamber of Commerce presents a $1,500 check, a portion of the proceeds from the Chamber's Annual Golf Tournament in August 2018, for the Rotary Club of Hamburg's Warm the Children Program. From left to right are Deb Welch, Evans Bank; Brandi Reed, Rotary Club President; Jerry Bastedo, Rotary Club Past-President; Shawn Buffum, Chamber Chair; Cyndi Matla, Chamber Executive Director; Molly Georger, Chamber Board Member. In 2017, 524 children in 220 families received new coats and clothing as a result of the Rotary Club of Hamburg Warm the Children program. In 2018, it is anticipated over 500 children will be recipients of new clothing. Additional in information on Rotary's Warm the Children program may be found by visiting www.hamburgrotaryclub.org. A special thank you to all the volunteers and patrons of the 2nd Annual Meat Raffle. 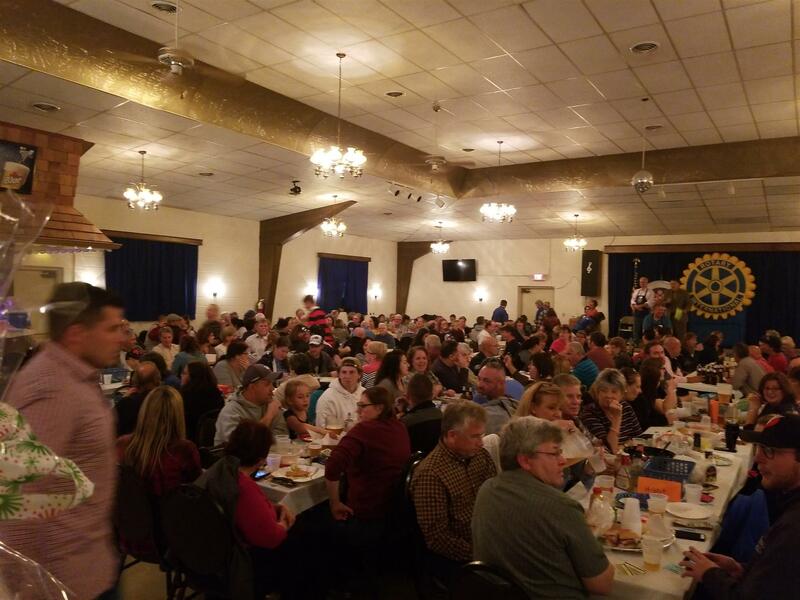 More than 300 people attended and as can be seen by the photo, all had a lot of fun winning steaks, ribs, turkey or bacon to name a few! Proceeds are used to help fund our Warm the Children program and area high school scholarships. Hope to see you next year and Remember - MEAT, MEAT, MEAT, MEAT! The Rotary Club of Hamburg will hold Shredding Day on Saturday, Sept. 22 from 9 a.m. to noon in the parking lot of Howard Hanna, 3674 Commerce Place (off Camp Road, Rte. 75) in Hamburg. The public is invited to bring their sensitive documents for shredding in boxes or bags (10-inch by 12-inch by 15 inch or 24 inches) or 10-inch by 15-inch by 24 inches, or medium kitchen-size bags of papers). The Rotary Club of Hamburg inducted Sarah Fiorella into the service organization that is part of a worldwide body. Rotary President Brandi Reed, left, conducted the ceremonies welcoming Fiorello who is a first grade teacher with the Eden School District. Rotary supports projects on the local, national and international level. The Hamburg club was founded 76 years ago. The club coordinates Warm the Children, provides college scholarships to Hamburg and Frontier high school students and is one of the four service organizations that coordinates the Burger Fest each July. Upcoming fundraisers include Shredding Day Sept. 22 and the 2nd Annual Meat Raffle Oct. 13. The Rotary Club of Hamburg meets Tuesday evenings at 6 p.m. at JP Fitzgerald’s Restaurant in the Village of Hamburg. The Rotary Club of Hamburg at its June 12 annual spring picnic honored two of its own for earning the Paul Harris Award, a high honor named for Rotary’s founder. From left, are Rotary President Jerry Bastedo, Patricia Castiglia, placing the pin on the lapel of award winner Jim Loomis, Tom Johnston and honoree Tim Hoelscher. Both men have served the Rotary Club of Hamburg and the greater community as active members. Rotary supports projects on the local, national and international level. 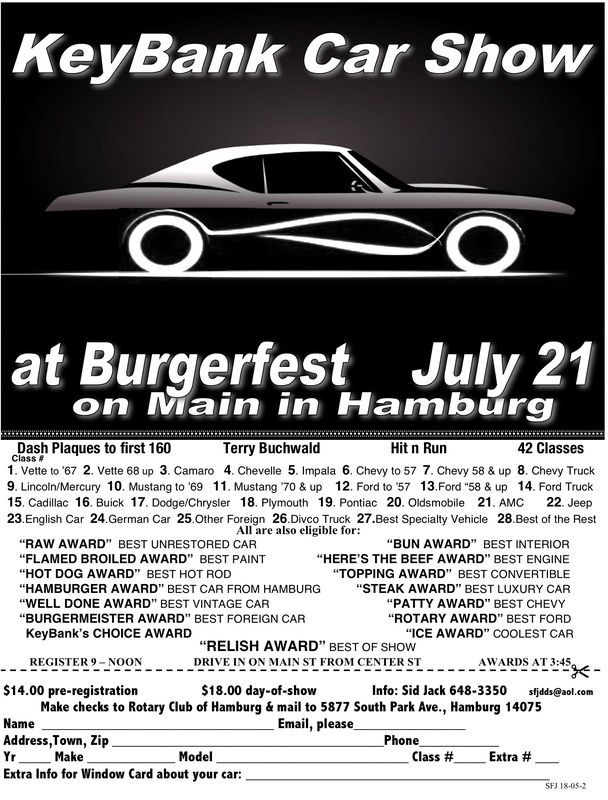 The Hamburg club was founded in 1942 and since 2007, has coordinated Warm the Children, provides college scholarships to Hamburg and Frontier high school students and is one of the four service organizations that present the BurgerFest each July. Once again the Rotary Club of Hamburg will be participating in a youth exchange program. Rotary International hosts and sends high school students on an educational exchange with countries around the world. Our Hamburg club is sponsoring an outbound student who will be going to Argentina. We are hosting a young man from the Czech Republic who will be attending Hamburg High School. It is preference of Rotary that each of our students stay in three homes for about three and a half months each. We believe in that way students have a chance to experience more than one type of household and one type of family while they are here. If you are interested in hosting a student this year, or learning more about the program, please email lavery23@gmail.com and we will get you more information. This program benefits the student as well as the Hamburg household who welcomes a guest. Truly a student may enter your home as a guest, but most leave as family. To do research on your own, simply go to www.rotaryye7090.org to learn more. Paul Becker and Karl Swarts gave a presentation to club members and guests on the Hub and Spoke Fitness Trail. Their presentation included the overall plan of integrating a multimodal trail throughout Hamburg. The Rotary Club of Hamburg has adopted a section of Camp Road in Hamburg and each spring Jim Loomis rounds up members to ensure that section of the road is debris free. This year 15 members attended the clean-up which was followed by dinner at Major Tom's. The Rotary Club of Hamburg recently inducted two new members into its ranks. Rotary President Jerry Bastedo, middle, conducted the ceremonies welcoming Ryan Brunner, left, of the Baillie Lumber Company, and Tyler Shaw, of GCW Capital into the 76-year-old Hamburg service organization. 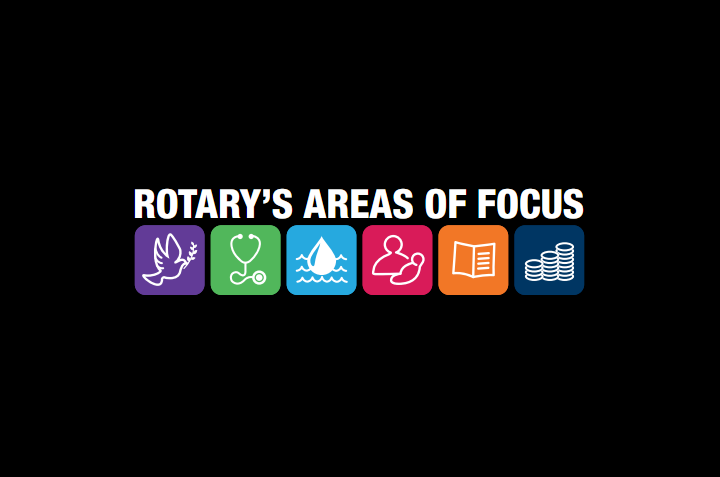 Rotary supports projects on the local, national and international level. Locally, it coordinates Warm the Children, provides college scholarships to Hamburg and Frontier high school students and is one of the four service organizations that coordinates the Burger Fest each July. Rotary meets at 6 p.m. Tuesdays at JP Fitzgerald’s Restaurant. For the 15th year, the Rotary Club of Hamburg is hosting a Breakfast with the Bunny for children, parents, grandparents, and anyone interested in an Easter holiday event. The breakfast will be held Saturday March 24th, 2018 at Oakwood Manor, 2985 Lakeview Rd. (across from the Hamburg Ice Arena). A pancake and sausage breakfast with other “breakfast goodies” will be served. Face painting will be provided free of charge by the Hamburg YES students and a theme basket auction will be available with outstanding baskets. Our own Easter Bunny will be present to delight the children. Photos with the Bunny can be taken using your own camera at no charge. Two seating times are available: 9:00 am to 10:30 am and 10:45 am to 12:10 p.m. Presale tickets are recommended due to limited seating and may be obtained by calling 867-8388 or by email at BreakfastWithTheBunny@gmail.com. Walk-ins will be accommodated on a space available basis. Tickets cost $5.00 for children 2-10 years old and $9.00 for ages 11 and up. Advance sale tickets will be available for pick- up at Brierwood Wine and Spirit Shoppe, 5452 Southwestern Blvd., at the corner of Southwestern Blvd. (Rte 20) and Rogers Rd. Interested in hearing more about our club? Please contact Kent Hilton, Membership Chair at khilton@sigmarep.com. We appreciate your interest in service.